Duane Michals: Storytelling – Goat anyone? What’s been the most amazing thing you’ve seen today? 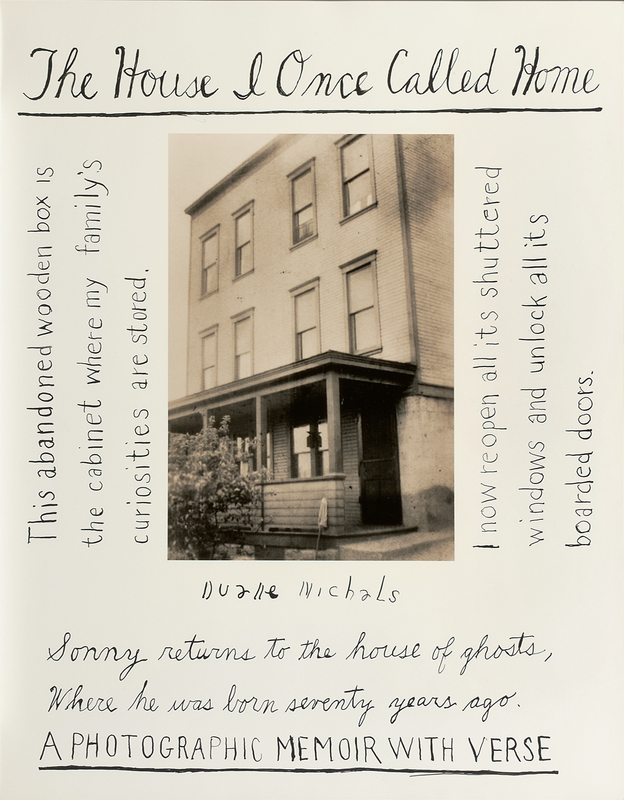 If you’ve been to the Peabody Essex Museum you might name the photographs of Duane Michals featured in “Storyteller” on view through June 21 as pretty amazing. Through image sequences, multiple exposures and the overlay of handwritten messages, Michals has developed a decades-long trailblazing reputation for challenging conceptions of what a photograph is and how it carries meaning. Consider “Chance Meeting”: A sequence of six gelatin prints documenting two men passing in an alley. A pedestrian subject if ever there was one. Taken individually a viewer might not think to questions beyond how and why, focusing on the work and the artist, leaving the subject and its potential relevance just out outside the frame. As a series, though, a narrative starts to take shape and questions of what, what if, and what now are inescapable. No longer a static photograph to be admired and/or critiqued, the work becomes an invitation to engagement and possibility. At a recent Cultural Conversation in PEM’s atrium, I found the artist himself pretty amazing. Pre-conversation, settled on stage dressed in a Pantone-approved marsala colored Mr. Rogers inspired cardigan, I first feared the 83-year-old legend would be so passive and timid chief curator Lynda Roscoe Hartigan would struggle to maintain conversational flow, let alone vigor. That fear, mercifully, lasted mere minutes, for as soon as Michals started speaking it was apparent that Hartigan’s chief task would be keeping him on topic and on-color. Of the many flashes of brilliance Michals meandered through, most are not printable here. I have never before laughed so much in that space. He spoke about his proximity to celebrity: working with Magritte and talking on the phone with Andy Warhol (not as thrilling as one might think). 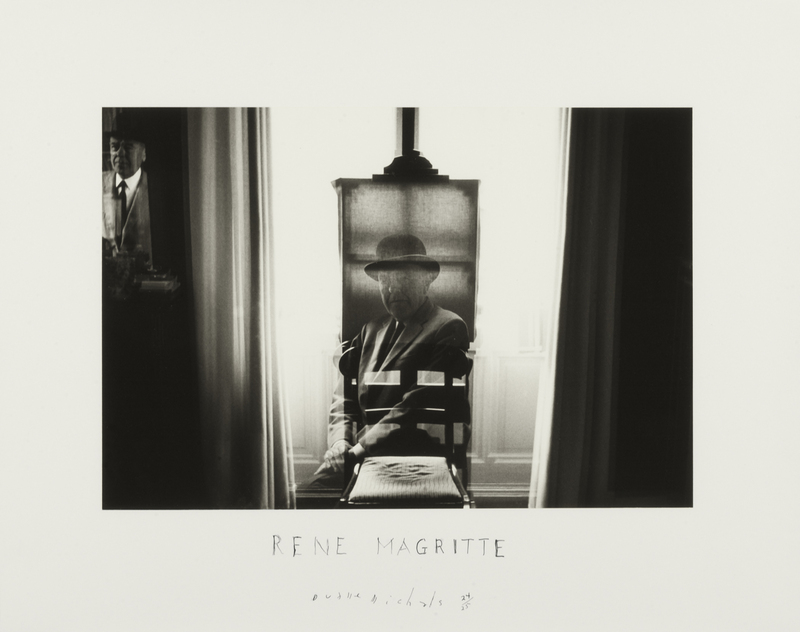 Duane Michals, Magritte at his Easel, 1965. Gelatin silver print. The Henry L. Hillman Fund. Courtesy of Carnegie Museum of Art, Pittsburgh. While he would not indulge a question about his camera, he described in detail a daily, animating search for amazement. A constant testing of boundaries in pursuit of creation. After the conversation, another Manhattan (Michal’s preferred tipple) and a parting plate of antipasti I found myself in the coat check line with the artist and took the opportunity to ask what he’d seen that day that had amazed him. A little sleuthing revealed that earlier that day Michals had been shown some items in storage including some panels of the Strathallan Castle Wallpaper, an extraordinary hand-painted Chinese panorama from about 1790 which hung on the walls of the ladies’ salon at Strathallan Castle in central Scotland. Could this be the thing that so amazed the provocative of-the-moment contemporary artist? What did he see in it? Did it perhaps remind him of the 30-photograph sequence “The House I Once Called Home” in which he explores the abandoned three-story brick house where he spent his child? Or something else entirely. . .
What imaginative possibilities did it raise for him? Have you been amazed recently?